These miniature red hearts send a big message of love! Great for attendance charts, as reward stickers, or just for letting kids at Sunday school, class, or home know you care. Theyre also perfect for simple crafts or sealing a Valentines card. Six sheets, 36 stickers per sheet; 216 stickers per package. 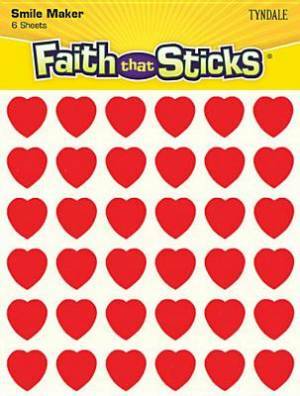 Miniature Red Heart Stickers by Faith That Sticks was published by Tyndale House in October 2013 and is our 5083rd best seller. The ISBN for Miniature Red Heart Stickers is 9781414392752. Be the first to review Miniature Red Heart Stickers! Got a question? No problem! Just click here to ask us about Miniature Red Heart Stickers.